I’ll spare you a lengthy intro about the origins of potatoes au gratin because, well, I don’t really know or care where this tasty dish came from. I’m just happy to have it. 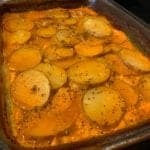 Instead, I’d like to briefly explain what makes these creamy potatoes au gratin healthy since healthy can mean something different for everyone. 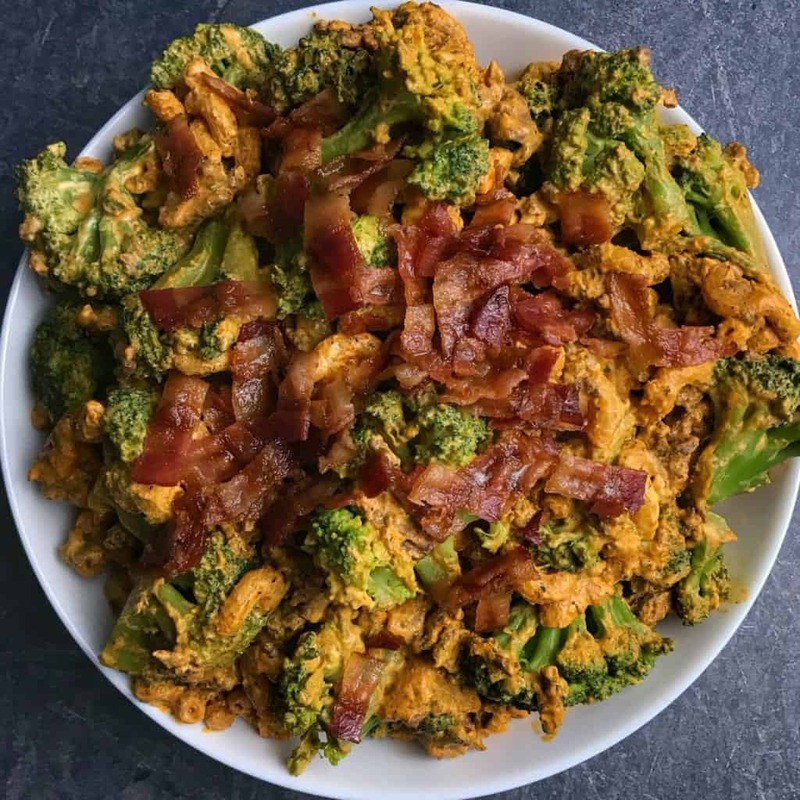 If you’re unfamiliar with my blog, I primarily make lower calorie, higher protein recipes. 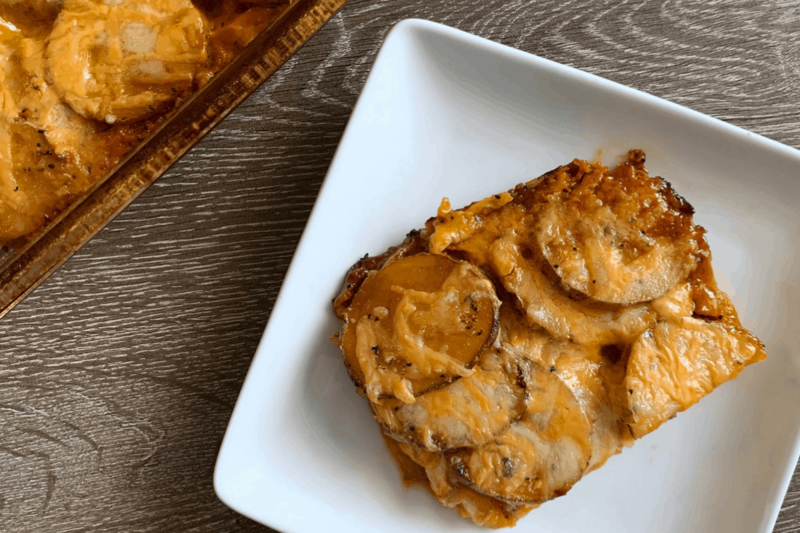 There are no ingredients off limits, and things like cheddar powder in these potatoes au gratin create loads of flavor while keeping calories under control. Because, in my opinion, losing body fat is one of the healthiest moves you can make. 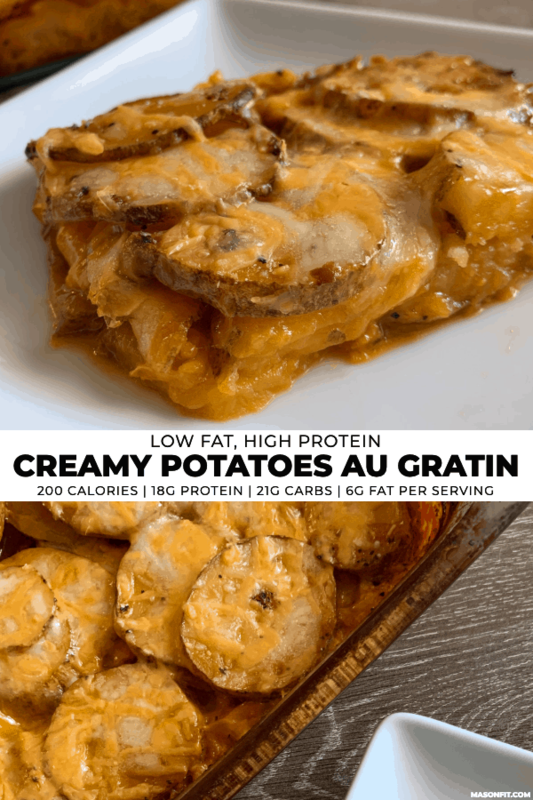 So if you’re wondering how creamy, cheesy potatoes could possibly be healthy, it’s because you’d be pressed to find another potatoes au gratin recipe with 18 grams of protein and just 21 grams of carbs per serving! These are all customizable, as always. Want to use almond milk, do it to it. Rather have all cheddar? It’s your world. 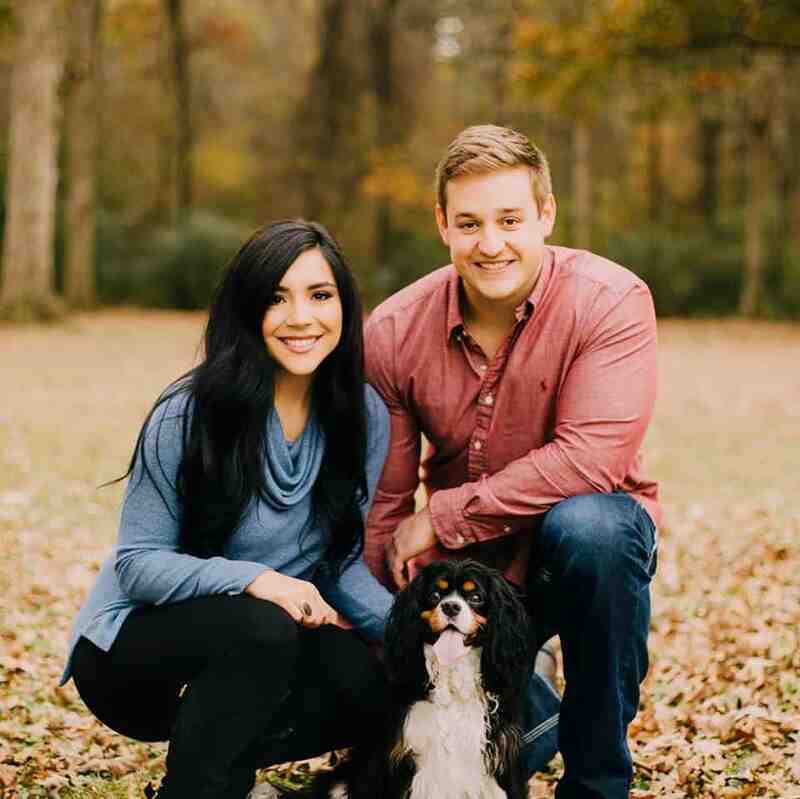 Okay, I said almost everything you need because there are two ingredients that you may not be familiar with—cheddar powder and collagen peptides (unflavored protein powder). I’ll fill you in about both ingredients and substitutions below. I always compare this magical ingredient to powdered peanut butter. It’s essentially dehydrated cheddar cheese in powder form that can be reconstituted for cheese sauce or added straight to things like popcorn or chips for cheddar flavor. Is cheddar powder the healthiest ingredient out there? No, of course not. But like anything, it’s perfectly fine in moderation. Collagen is a structural protein and is known for supporting for hair, skin, nail, and joint health. In supplement form, collagen peptides are a tasteless powder (in most cases) that provide 20 grams of protein per serving. Or at least the Bowmar Nutrition Collagen Peptides I used for this recipe provide 20 grams per serving. 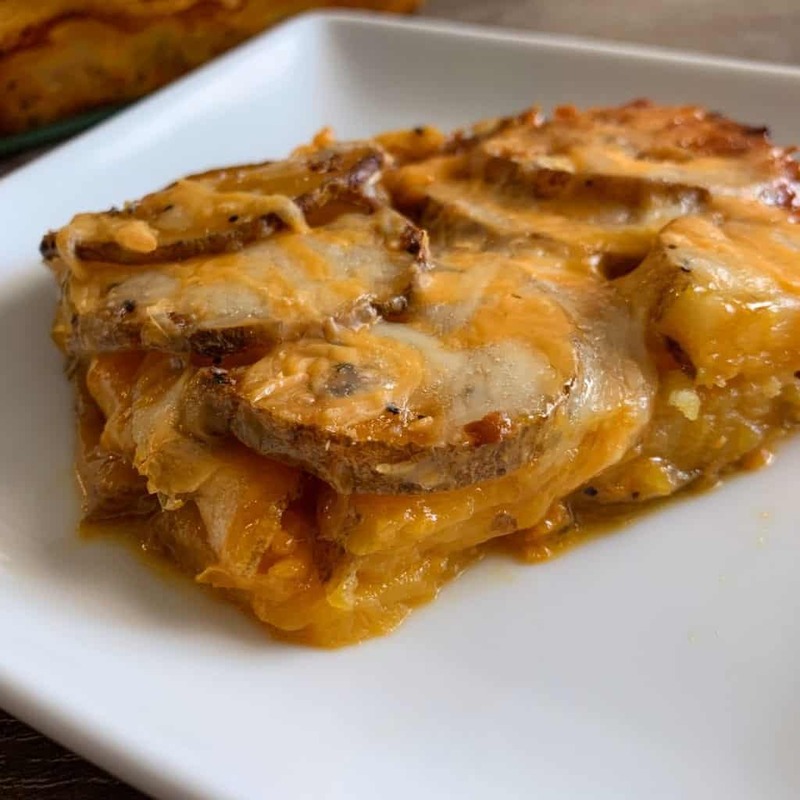 Since they’re tasteless, they’re perfect for savory recipes like these potatoes au gratin. They add 60 grams of protein and, in combination with the cheddar powder, act as a thickener for the cheese sauce. I guess you could say they’re as vital to the structure of this recipe as they are to your joints. Ba dum tiss. Since this ingredient isn’t all that common, you could get away with another unflavored protein powder if you have it on hand. Or if you want to skip the protein altogether, you could scale back on the liquid ingredients a bit. I haven’t tested it, but I’d guess reducing 1/2 to 1 cup of milk would do the trick. With the longer cook time and oven variance, you may have to tinker a tiny bit with cook time. 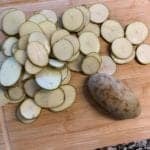 My biggest tip is to cook for the full 60 minutes before uncovering to let the potatoes fully cook. Once you uncover the potatoes, the remaining liquid will quickly cook off and you can melt the cheese on top at the very end. If you make these potatoes au gratin, grab a photo and tag me on Instagram @mason_woodruff. Or you can join my free Facebook group and share it with the Proton Party! A lower fat, higher protein version of cheesy potatoes au gratin. Preheat oven to 450F and spray a 13x9 baking dish with nonstick cooking spray. 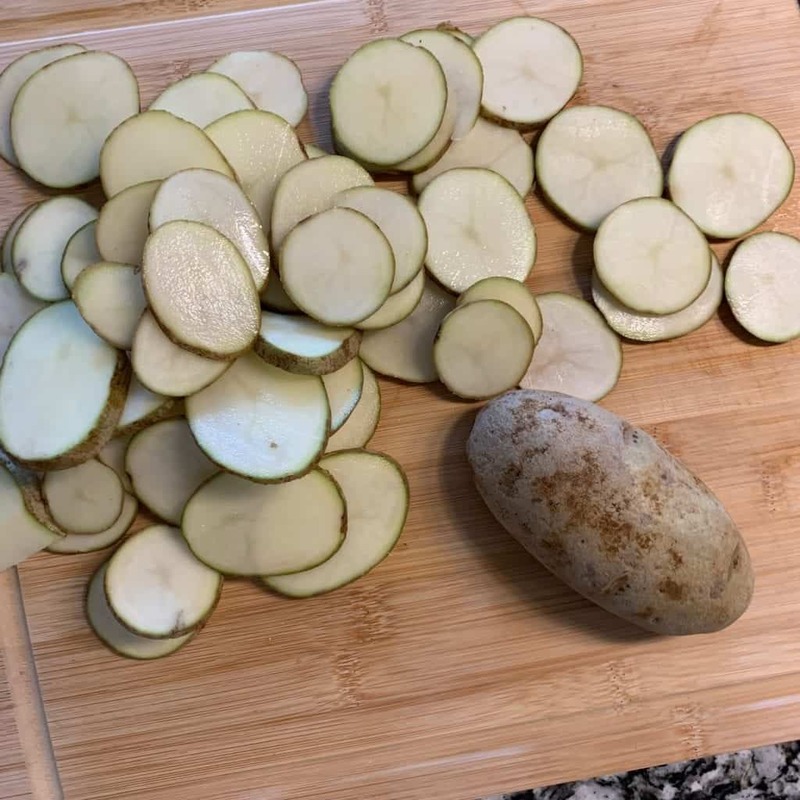 Thinly slice (about 1/4 inch) the potatoes using a knife or mandolin. Add the potatoes to the baking dish. 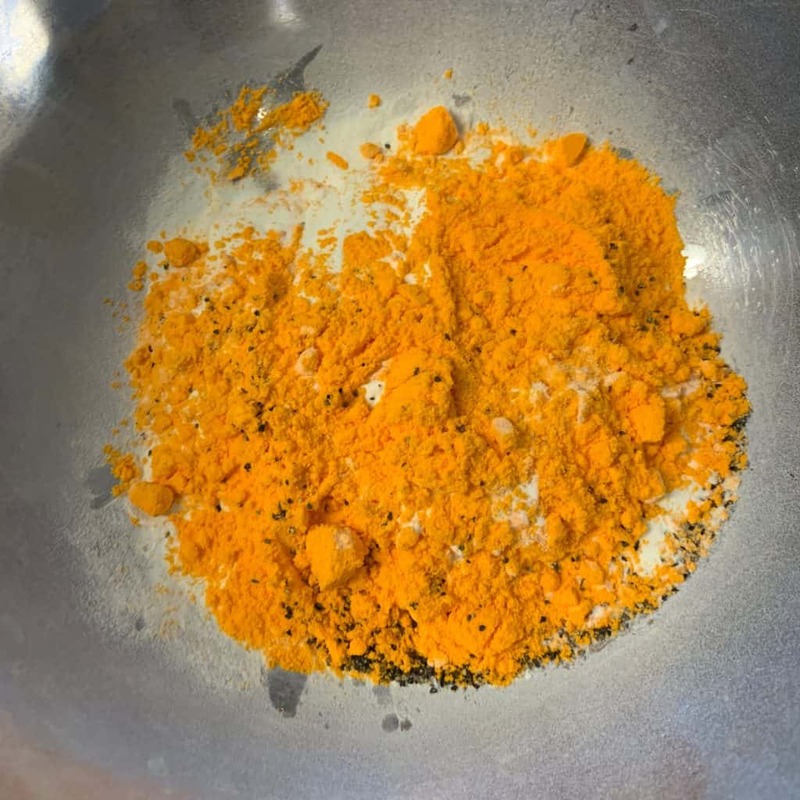 Mix the cheddar powder, collagen, black pepper, and any other seasoning you'd like in a large bowl. Add about a half cup of milk, mixing well to avoid any clumps in the dry ingredients. Gradually add the remaining milk, yogurt, and butter. Mix until smooth. Cover the baking dish with foil and bake for 60 minutes. Remove the foil and bake for an additional 10-15 minutes or until very little liquid remains in the dish. Top the potatoes with the shredded cheese and bake for an additional 5 minutes or until the cheese is fully melted. 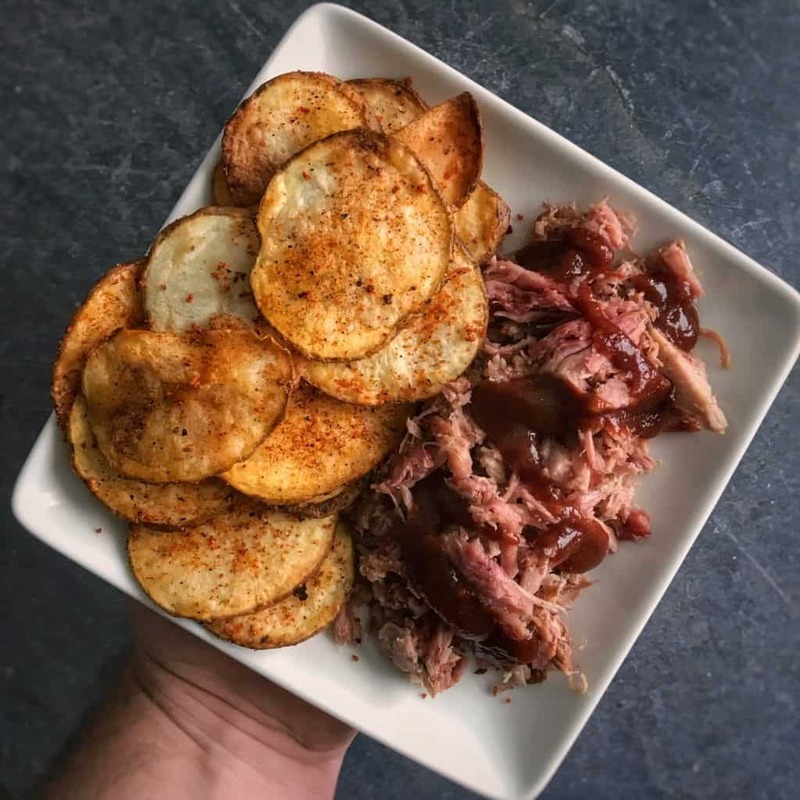 If you’re a crunch fan, you need to try my air fryer potato chips. There’s a cheddar version so you can use cheddar powder, and there are instructions for the oven as well. 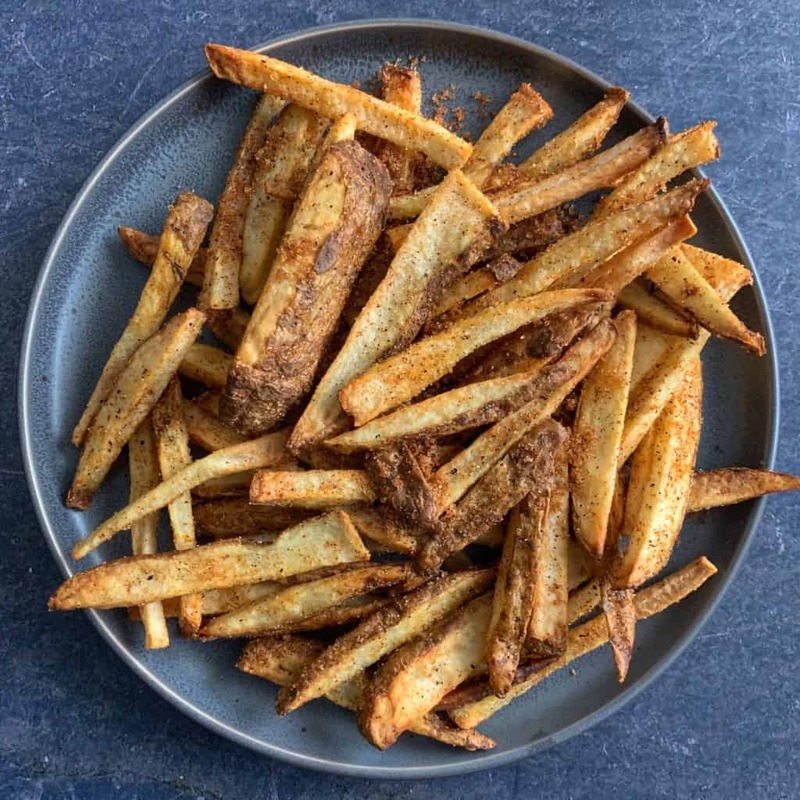 And if you’ve never had fries from Wingstop, you have to check out my lower calorie copycat Wingstop fries recipe.